Distinguished from The Concerto Number 1 by its convex rubber grip, The Concerto number 2 Ball Pen is one of our more time-honoured executive pens. Its all-metal construction, comfortable writing experience and low price point has given this promotional pen universal appeal. Our uniquely-designed construction ensures that it complies with the latest safety regulations and it comes with a high quality black refill containing documental ink as standard. 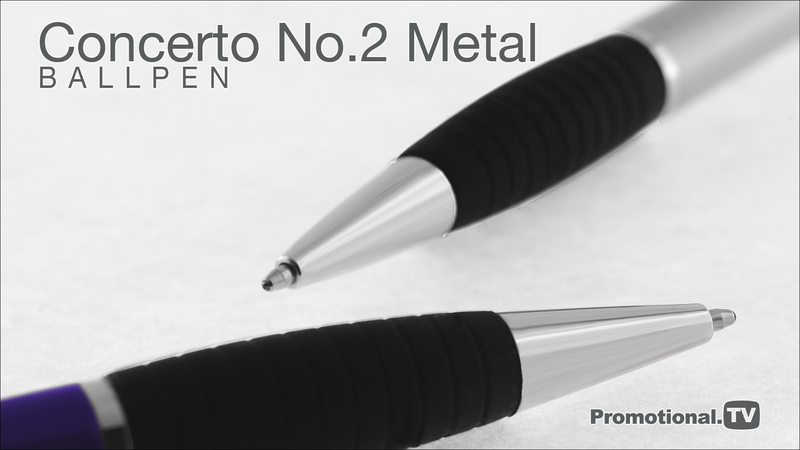 The Concerto Number 2 Ball pen operates on a near-silent twist-action mechanism and multicolour printing is available on request. We are no longer constrained by the industry-standard small print area for this product as we have developed an entirely new system that allows us to print over most of the barrel, as demonstrated here. It is supplied with free display tube as standard and there are many alternative packaging options to choose from in our extended range.